We are committed to safeguarding the privacy of all of our website visitors. Great Day Improvements is committed to protecting your privacy when you visit www.patioenclosures.com. When you visit the Site, we may collect personal information from you by which you can be identified, including without limitation your name, address, email address, phone number (“Personal Information”). You may visit our Site without providing Personal Information; however, if you do so, some functionality of the Site may remain unavailable to you. Our third-party hosting company will also collect additional, non-personally-identifiable information from you (“Non-Personally-Identifiable Information”, together with Personal Information collectively referred to as “Information”), including without limitation the URL you came from, your IP address, your domain name, your browser type, the country and state where your server is located, and the pages that were viewed during your visit to our Site. All Information is kept on a secure server to protect it from disclosure to outside parties. information relating to anything you purchase, services you use, or transactions you make through our website, including your name, address, telephone number, email address and credit card. Great Day Improvements does not sell or rent your Information to others. Except as set forth herein, and unless required by law, we will not distribute your Personal Information to third parties without your permission. We may disclose your personal information to any of our employees, officers, insurers, professional advisers, agents, suppliers, or subcontractors as may be reasonably necessary for the purposes set forth in this policy. We may disclose your personal information to any member of our group of companies which may include our subsidiaries, our ultimate holding company and all its subsidiaries, as is reasonably necessary for the purposes set forth in this policy. Our data retention policies and procedure are designed to help ensure that we comply with our legal obligations regarding the retention and deletion of personal information. to establish, exercise, or defend our legal rights, including, but not limited to, providing information to others for the purposes of fraud prevention and reducing credit risk. Great Day Improvements is committed to ensuring that your Personal Information is secure. To prevent unauthorized access or disclosure of your Personal Information, we use suitable, industry-standard physical, electronic, and managerial procedures to safeguard and secure the Personal Information that we collect via the Site. We will take reasonable technical and organizational precautions to prevent the loss, misuse, or alteration of any of your personal information you have provided. We will store all personal information you provide on our secure, password- and firewall-protected, servers. Any and all electronic financial transactions entered into our website will be protected by encryption technology. You acknowledge that the transmission of any information over the internet is inherently insecure, and we cannot guarantee the security of data sent over the internet. You may request details about your Personal Information that Great Day Improvements holds by emailing us at general@greatdayimprovements.com. If you believe that any of your Personal Information is incorrect or incomplete, please email us at the foregoing email address to request correction. Upon receipt of your email, we will correct any of your Personal Information found to be incorrect. Cookies may be either “persistent” cookies or “session” cookies. A persistent cookie will be stored by a web browser and will remain valid until its set expiry date, unless deleted by the user before the expiry date. A session cookie will expire at the end of the user session, when the web browser is closed. Cookies do not typically contain any information that personally identifies a user, but personal information that we store about you may be linked to the information stored in and obtained from cookies. We use both session and persistent cookies on our website. Blocking all cookies may have a negative impact upon the usability of many websites. If you block cookies, you will not be able to use all the features on our website. Great Day Improvements collects information through cookies and other similar technologies. We may use third parties to provide advertisements for other websites that may be of interest to you, based on Information collected about your use of our Site and other websites. To do this, these Great Day Improvements and/or these third parties may place or recognize a unique cookie on your browser, which may include without limitation the use of pixel tags and/or web beacons. You can choose to accept or decline cookies; most browsers automatically accept cookies unless you modify settings to decline them. However, declining to accept cookies may prevent you from taking full advantage of the Site. Further, Great Day Improvements does not recognize automated browser signals regarding tracking mechanisms, which may include “do not track” instructions. Great Day Improvements also uses web analytics services, which currently include without limitation Google Analytics, and Crazy Egg and Mouseflow analytics. Although we currently use the foregoing analytics services providers, Great Day Improvements reserves its right, within its sole discretion, to change analytics services providers, or to add additional analytics services providers, without notice to you. Great Day Improvements currently uses Google AdWords, Facebook, and Bing Remarketing Services as remarketing services providers. Great Day Improvements reserves its right, within its sole discretion, to change remarketing services providers, or to add additional remarketing services providers, without notice to you. You can set preferences for how Facebook advertises to you or opt out in your browser or device settings. To opt out of Bing or another third party, you may use the NAI opt-out tool, which will allow you to opt out of targeted ads from NAI-approved member companies. The advertisers we use are members of the Network Advertising Initiative (NAI) and adhere to the NAI Code of Conduct. If you feel that this site is not following its stated information policy, you may contact us at the above address or phone number or contact the Federal Trade Commission by phone at 202.FTC-HELP (202.382.4357), or electronically using the FTC Complaint Assistant. We can be reached via email at general@greatdayimprovements.com or you can reach us by telephone at 888-468-0700. 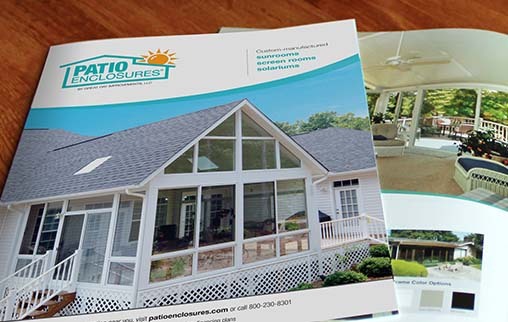 Request Your Complimentary Sunroom Catalog Today! Find out how we custom design and custom manufacture our products specifically for your home.